The Silk Paintings of Artist, Traci Batchelor Paden are a fusion of luxurious silk, vivid color, and artistic expression. Pure, white silk is her chosen palette, French silk dye is her paint, resist is her line, and the result is her art. After the silk is stretched, the design is drawn with a thin line of resist. Silk dye is then painted in the areas separated by the resist. The piece is finished with a 4-hour steam setting process that “locks” the dyes into the silk to achieve luminous and lasting colors. Traci lives and works on Wolftever lake in a house that she and her husband designed and built in 2009. After 10 years of living in New Orleans, she has found herself very happy in Chattanooga, TN. Inspiration comes from nature, music, and the positive energy that surrounds us every day. Traci holds a Master of Fine Arts in Design. 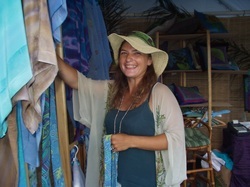 Silk Painting has been a passion for Traci for about seventeen years now. For the past ten years, it has been her full time occupation. The work is ever changing and growing. It is to be enjoyed! Treat yourself well! I will be happy to fill a special order for you. Please note that I do not accept returns on special orders. If for any reason your order is not as expected, I will do my best to make you happy or you may exchange your item within 30 days.